This is exactly what we all would like to see from our carriers, not just open-ended rumors that the update is "on the way", but an actual list of Android 4.0 updates with an ETA for every device involved. 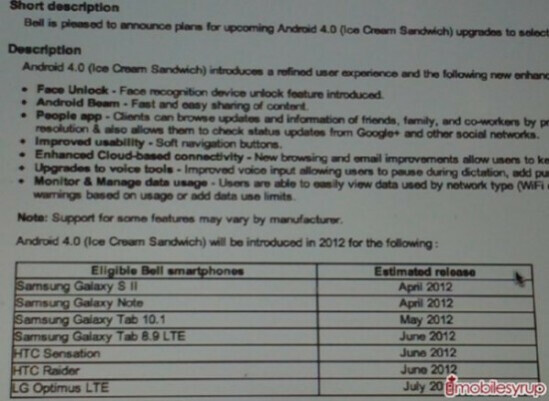 Bell Canada has had its Ice Cream Sandwich update plans leaked. The list only has 7 devices on it though. If the list is correct, the Samsung Galaxy S II and Samsung Galaxy Note are first up for the ICS update, which should hit in April. May only has the Samsung Galaxy Tab 10.1 update there. June is a big month with updates for the Samsung Galaxy Tab 8.9 LTE, HTC Sensation and HTC Raider. And, the LG Optimus LTE rounds out the updates in July. Even if it is a limited number of devices, it's nice to see that a carrier in North America can give customers some sort of notice, even unofficially, of when the updates are coming. The best we've seen from any US carriers has been Verizon's announcement that there are updates "currently scheduled" with no timetables given. Canada - their beady little eyes... their flapping heads, so full of lies. Don't get your cervix in a twist, it's an obvious southpark reference. None taken. Taking the internet seriously is like not realizing that there's no way to escape life alive. Some people are just overly sensitive though, I guess. Well according to Engadget/Best Buy, the Droid RAZR(MAXX)/HTC Rezound will be getting ICS starting April 4th. XDA devs put ICS on my I9000M SGS (Bell) in January. And that should keep the phone fresh until May and the unveiling of the SIII! 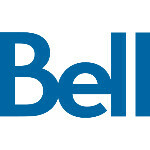 Thanks but no thanks, Bell.